Okay, okay. I hear you, Tarot! We’ve got a little more Tarot Court to address today. 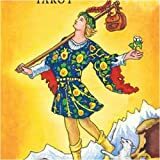 Yesterday, it was the Knight of Swords, delivering admonition to be careful how we charge ahead with those words and thoughts, being cognizant of exactly HOW we pack truths in need of delivery. Understood. Today, we’ve got the Knight of Wands (Air in Fire). He moves—and quickly!—often with creative solutions to problems or getting new arrangements off the ground. The desert around him, his horse, the feather in his cap and even his hair are fiery red! He is positively ablaze, on a mission. Just as we’d be well cautioned with the Knight of Swords to consider the climate, here the same consideration applies as far as consequences go. This guy tends to act in haste, reflect in leisure. Bravery, passion and ambition are all fine qualities. But make the risks you take calculated ones for the best results. When the Knight of Wands appears, know it’s fine both to move ahead with your plans and to feel good about doing so. Wands build, and require action to be most effective. So yes, act! But since it IS a single-minded Knight showing up (and this one is especially driven), do slow yourself enough to consider both sides of relevant issues. Then you can follow the impulse with high expectations, regrets less likely to follow. Are you feeling the Knight of Wands? I do feel that fire energy in me for the last couple of days. Enough with the BS… Time of change is now… Miracles are happening. Time to rebuild and create a new world for my life.